General Kitchen Assistants wanted NOW by Cheltenham’s Contemporary Cake Designs. Busy professional kitchen requires hard-working kitchen assistants/ pot washer. Basic food preparation, keep the kitchen, equipment clean and tidy, washing up, cleaning kitchen surfaces, deep cleans, rubbish removal. 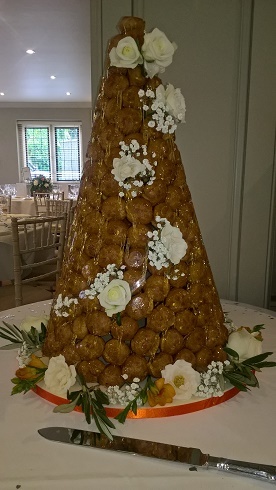 Contemporary Cake Designs have just created another stunning Croquembouche. Many Thanks for the most amazing croquembouche! Everyone was amazed by it and enjoyed eating!!! Thanks again for all your help and organizing! With the Contemporary Cake Designs pedigree you are ensured a “wow factor” cake for any occasion- be it a Wedding, Birthday, Christening, Corporate or Novelty, with the secure knowledge that you are dealing with experts from start to finish.